The Domain Name System (DNS) is a very crucial component to the internet. It lies in the shadows and resolves domain names into machine readable IP addresses, simplifying the world of web for us. Besides that DNS servers have a plethora of information for every possible existing Domain which is stored in the form of ‘Resource Records (RR)’. This data can be of immense help to professionals who analyze domains and its connected network, be it for malicious activities or simply for business research or monitoring. Understanding its magnitude and the help DNS server data can provide to various professionals, WhoisXmlApi is now proud to get the Internet’s Dark Knight on board! 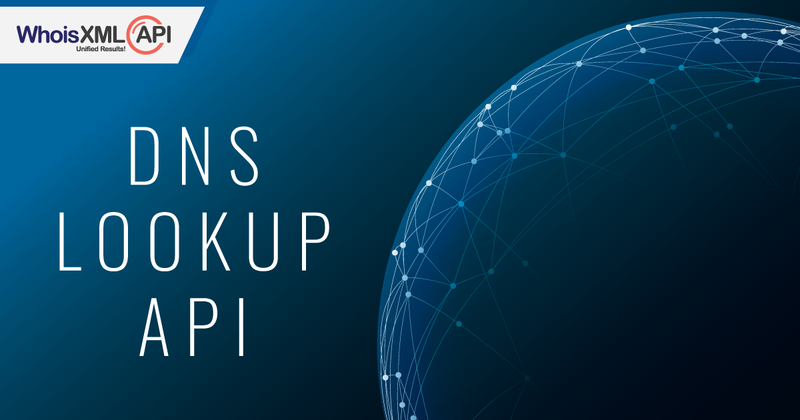 Introducing DNS Lookup API, a REST API that with a single query can help you get over 50 types of DNS Resource Records. Now, most people have heard of the common A record, NS record, MX records but besides these, there are many other RRs which can provide an in-depth knowledge about a domain. Below we will give you a basic gist of all the RRs that are a part of DNS servers and of course you can avail all of these RRs with a DNS Lookup API! It is the most basic type of DNS record and is used to point a domain or subdomain website to an IP address. It is often used to associate new subdomains with an existing domain’s DNS records. It specifies the mail exchange server/s for a domain. It specifies which Name Server is authoritative for the domain. It is used to store any text-based information that can be grabbed when necessary. Most commonly TXT records are used to hold SPF data and verify domain ownership. It contains the email address of the responsible person(s) for the specified DNS domain or host. It provides information about a host’s hardware type and Operating System (OS). It specifies core information about a DNS zone, including the primary name server, the email of the domain administrator, the domain serial number, and several timers relating to refreshing the zone; like how often it is updated etc. It maps a hostname to a 128-bit IPv6 address. It describes the services provided by the specified host like POP, MX, HTTP, FTP, UDP, TCP etc. It is used for locating AFS and OSF type database resources through the DNS. It specifies the subtype and service location for the AFS/ OSF resource. It maps a DNS domain name in the owner field to a Public Switched Data Network (PSDN) address number. It maps a domain name to an ISDN telephone number that consists of a country code, a national destination code, an ISDN Subscriber number and, optionally, an ISDN sub-address. It specifies an intermediate host that routes packets to a destination host. It specifies the address of an NSAP resource thereby mapping domain names to NSAP addresses. It works as a reverse NSAP, linking an NSPA address to a host domain name. It maps a domain to the SRV record containing the instructions for contacting a SIP server with the specific transport protocol in the NAPTR service field, i.e. NAPTR records provides a mechanism for the domain to specify which protocols it prefers a SIP request to use. It specifies a public key that is associated with a DNS name. The key can be for a zone, a user, or a host. It specifies the physical location of network components, which can be used by applications to evaluate network efficiency or map the physical network. It is the DNS Locator. It maps DNS domain names and X.400 address for email address mapping. It indicates the nonexistence of a name in a zone by creating a chain of all of the literal owner names in that zone. It identifies the location of the servers for a specific service, protocol, and DNS domain. It defines services available in the zone, for example, LDAP, HTTP, SIP etc. It is used to map DNS domain names to ATM addresses. It provides information about the public key certificates or certificate revocation lists (CRLs) in the zone file. It is used to map an entire sub-tree (subdomains) of the DNS name space to another domain. It specifies lists of address ranges e.g. in CIDR format, for various address families. It is used to identify the Domain Name System Security Extensions (DNSSEC) signing key of a delegated zone. It contains fingerprints for public keys used for SSH in order to aid in verifying the authenticity of the host. It contains a public key that is associated with a DNS for use with the Internet Protocol Security (IPsec) protocol suite. This can be the public key of a host, network, or application. It holds a DNSSEC signature for a record set (one or more DNS records with the same name and type). It points to the next record name in the zone (in DNSSEC sorting order) and lists the record types that exist for the record’s name. It contains the public key (of an asymmetric encryption algorithm) used in zone signing operations. It verifies the DNSSEC signatures in RRSIG-records. It provides client identification information in the DNS to uniquely associate the particular Dynamic Host Configuration Protocol (DHCP) client with the hostname being updated by the DHCP server. It points to the next record name in the zone (in hashed name sorting order) and lists the record types that exist for the name covered by the hash value in the first label of the NSEC3 -record’s own name. It is used by authoritative DNS servers to calculate and determine which NSEC3-records to include in responses to DNSSEC requests for non-existing names/types. It associates a TLS server certificate or public key with the domain name where the record is found, thus forming a “TLSA certificate association”. It contains the trust-anchors for the zones. It is used in Reverse Map zone files to map an IP address to a domain name. It is used when testing experimental DNS functions. It is used to specify and uniquely identify entities connected to the network. It is used to map from domain names to Nimrod Locators. Nimrod Locators are variable length strings of octets whose content is only meaningful to the Nimrod routing system. It maps a mailbox to a host (server). The results for this may not always show as most mail servers now only support MX records. It is used to specify mail group members where each member mailbox must be identical to a valid mailbox. The results for this may not always show as most mail servers now only support MX records. It specifies the mailbox of the responsible person and optionally a mailbox for errors for this mailbox or list. The results for this may not always show as most mail servers now only support MX records. It specifies a renamed mailbox and can be used as a forwarding entry for a user who has moved to a different mailbox. The results for this may not always show as most mail servers now only support MX records. It specifies the final destination to which a message addressed to a given domain name should be delivered. The results for this may not always show as most mail servers now only support MX records. It specifies a host that would forward mail on to the eventual destination, should that destination be unreachable. The results for this may not always show as most mail servers now only support MX records. It contains information about the algorithm used, validity interval, the signer name and the actual signature. The results for this may not always show as most mail servers now only support RRSIG records. It specifies the physical location of network components. The results for this may not always show as most mail servers now only support LOC records. It is used to specify the IPv6 address (or part of the IPv6 address) for a host. The results for this may not always show as most mail servers only support AAAA records. AAAA has a fixed length format while A6 has a variable length format. DNS Lookup API helps you get any/ all these records very easily. And all this information is fetched Real-time to ensure you have the most accurate data. So what are you waiting for? Purchase your queries now at https://www.whoisxmlapi.com/dns-api-pricing.php and get deeper insights into the domain world with DNS data.